There are delays on the M25 clockwise by Waltham Abbey after an earlier accident involving a lorry. One lane was closed as emergency services secured the scene and has since been reopened, but traffic is still returning to normal. In a separate incident, an accident involving another lorry has forced the closure of one lane anti-clockwise between Junction 27 and 26 at Honey Lane. Vehicles are moving at an average speed of 20mph and falling to ten mph at the junction with the A10 at Waltham Cross. Queues stretch back to Junction 24 and drivers are advised to plan ahead and avoid the route if possible. It is not yet clear what time traffic will return to normal. A lorry driver who killed two people after falling asleep at the wheel has been jailed for three years. Roger Sharatt, from Bagots Oak in Stafford, killed a brother and a sister on the M11 in Hertfordshire back in 2014. Four people detained after being found in the back of a lorry in Hoddesdon have told officers they are Iranian and Turkish nationals. All four were arrested on suspicion of illegal entry to the country and were taken into police custody. Their cases will be assessed in line with immigration rules, a Home Office spokesperson told the Mercury. Immigration Enforcement was contacted by Hertfordshire Constabulary yesterday afternoon (May 15) after police officers attended an incident on the A10 near Hoddesdon. A Home Office spokesperson confirmed the men presented themselves as Iranian and Turkish nationals. Police were called to the scene at 1.42pm to reports of several people in the back of a lorry and paramedics also attended to assess their physical health, which is believed to be in good order. The group were in a refrigerator lorry. Steve Gumble, who lives in Broxbourne, told the Mercury he saw the men in handcuffs “looking unhappy” on the roadside. 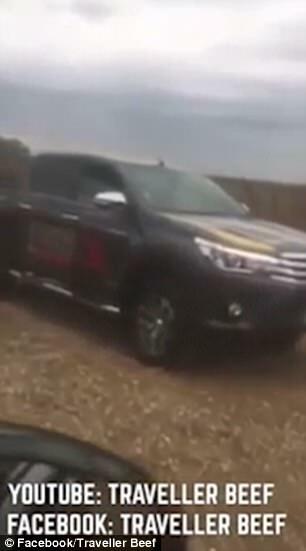 A bizarre video has emerged of a traveller purportedly filming his eight-year-old son driving a truck home. The footage appears to have been taken by the father of the boy in a car following closely behind. 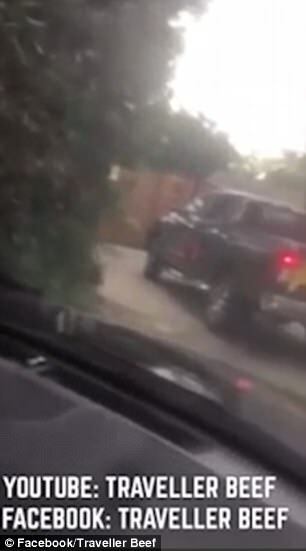 The clip starts with the black pickup truck, driven by the youngster, pulling out onto a busy Hertfordshire road and joining traffic seamlessly. As he films the truck, the unseen man says to a young girl beside him, who he calls Mary: ‘This is what we do – we don’t change because of times. Times maybe change but we don’t. ‘It’s no big deal. I done it since I was no age and he has to do the same. The four minute journey home hit a nervy moment when a car horn blares and two vehicles are seemingly forced to brake quickly behind the pickup truck as it pulls out onto a main road. The father asks the young girl, who didn’t use her seat belt and is sat in the front of the car, what the boy is doing. She says: ‘He’s driving her home. All by himself with no one to help him. 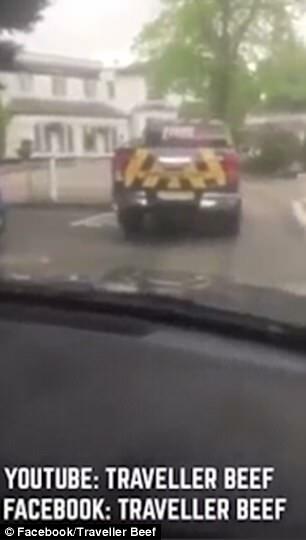 Then the car driven by the boy can be seen sharply braking as the driver attempts to manoeuvre it into a private lane. The car pulls onto the gravel driveway and spins around, coming back towards the camera. It then stops and the driver winds down the window to reveal a young boy at the wheel. 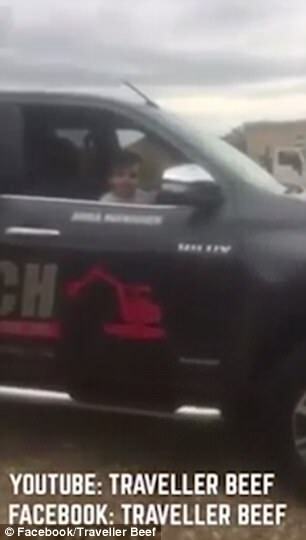 The footage was shared on Facebook by a group earlier this month with the caption: ‘8 YEAR OLD TRAVELLER KID DRIVES HIS DADDYS TRUCK HOME ON HIS OWN [crying with laughter emoji]’. It has been watched over 112,000 times and received a mixed reaction from viewers. The side of the truck is emblazoned with the logo for a plant hire company L-Lynch, which has a base in nearby Hemel Hempstead who have denied any links with the truck.